Despite its name, this 55th floor Palms-based nightclub is everything but paranormal. Though the Ghostbar monicker may not point to something supernatural - though the color-changing ghostly figure built into the ceiling may say differently - there is a certain aura about the nightclub that puts it a step above the rest. With unparalleled views of the Las Vegas Strip and the gorgeous surrounding mountain ranges, Ghostbar breathes a brand new life into Sin City's party scene. When you first walk into this ethereal club, you'll be greeted by a soft glow of purple and blue hues that complement the lightly colored accents and furniture decorated throughout. The club's most intriguing feature comes when you step onto the club's balcony. The exterior gives a breathtaking view of the Las Vegas Valley, that is until you shift your eyes to the floor below you. Once the shock of seeing nothing beneath you wears off, you'll find yourself gazing down at the Palms Pool and bungalows. Once brought back to the reality that you're not simply floating 55 stories above Sin City, you can shake the eerie feeling off in the comfort of one of Ghostbar's plush-leather sofas. Here, you'll come to find that the people of this property are far more inclined to indulge you in conversation rather than ignore you as in most other high-energy clubs. You won't have the distraction of annoying strobe lights or the over encumbrance of deafening music to struggled against when seeking pleasant conversation. Of course, the property houses a bar that serves up top shelf liquor; but rather than being the focal point of the party, the alcohol almost feels like a last minute addition or an afterthought. Where this venue truly differentiates itself from other nightclubs is its atmosphere. When you step into a nightclub like the Palms' Rain, you are immediately aware that you've entered a realm of partying, loud music, and a lot of drinking. At Ghostbar, you're treated to a more subdued attitude, one that doesn't rely on ear-bleeding and inebriation to deliver a night to remember. 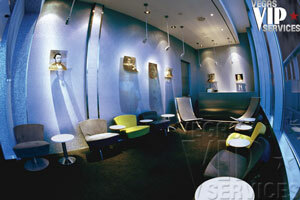 Ghostbar's lounge look and feel is complimented more-so by the complete lack of a delegated dance floor. Sure, you're at your own whim to get up and groove to the tunes spun by resident DJs Jordan Stevens, DJ 88 and MIKEATTACK, but chances are you may be the only making the most of the music. The focus here is being in a comfortable environment with people that you would otherwise pay no attention to on the streets. At other nightclubs, you may find yourself in a vexing situation, pressed into a vast sea of sweaty, drunk people as they all vie for the attention of the nearest sexual prize. The 300+ capacity of the Palms' Ghostbar ensures that your time spent in this unusual space will be stock piled with comfort and plenty of welcomed conversation. 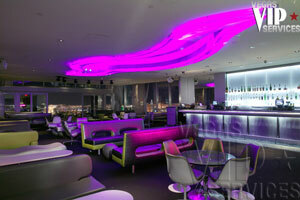 Contact Vegas VIP Services to reserve your VIP table at Ghostbar Las Vegas. Ghostbar has a stunning view of Las Vegas strip, although people are dancing, it is not a nightclub, it is a ultralounge. Go to Rain or Tryst if you like to dance. Ghostbar on the 55th floor at the Palms was made famous by the cast of The Real World Las Vegas in 2002 and it is still one of the most impressive clubs in Las Vegas. It is an 8,000 square foot indoor-outdoor lounge and sky deck offering a nearly 360 degree view of the Las Vegas skyline. The elegant Ghostbar Las Vegas features 14 foot floor-to-ceiling windows and is draped in the soft tones of silver, white, green, and gray. There is a 30 foot ghost-shaped soffit in the ceiling that constantly changes color.